1: Grays Athletic were formed in 1890. moving into the Recreation Ground in 1906. 2: They spent their early years in the Corinthian and Athenian Leagues, which are both now defunct. The latter was disbanded in 1984 following most of their clubs joining the Isthmian League. 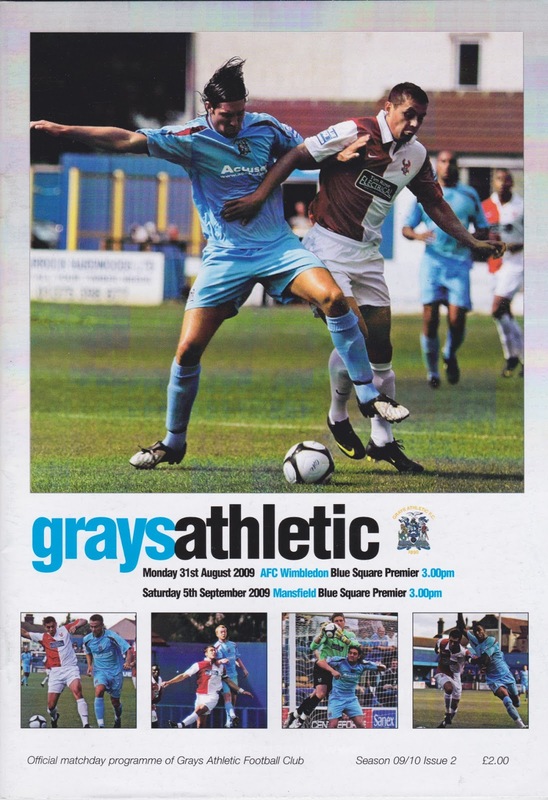 3: Grays themselves left the league prior to the previous season. They joined the Isthmian League at Division 2 level in 1983, enjoying a rapid rise up the divisions. By 1988 they were in the Premier Division, finishing a credible 5th in their first two seasons. The rise was not to last though and in the late 90's they were relegated to Division 1 for 3 seasons, returning to the Premier Division at the turn of the century after finishing runners-up to Croydon. 4: Following their return to the Isthmian Premier, they never looked back. A 6th place finish in 2003/04 was enough to see them admitted to the newly formed Conference South. They were Champions in their first season and played in the Conference Premier from 2005-10. A 3rd placed finish in 2006 remains their highest ever league position but they lost to Halifax in the playoff semi-finals. 5: The FA Trophy was won 2 seasons in a row in the mid-2000s. They beat Hucknall Town on penalties at Villa Park in 2005 before defeating Woking at West Ham's Upton Park the following year. 6: In the FA Cup the record progress came in 2005/06 when they reached the 2nd Round. They beat Cray Wanderers and York City before a 3-0 loss to Mansfield Town. 7: It was in the FA Cup that the club recorded their record attendance at The Recreation Ground. The meeting with Chelmsford City in a 1959 4th Qualifying Round tie attracted 9,500 supporters. 8: Many famous names have played for the club. Most notable was Aaron McLean who attracted their record incoming transfer fee when he moved to Peterborough United for £150,000 in 2007. 9: They left the ground in 2010 following the sale of the site to property developers. These financial issues led to them resigning from the Conference and after much wrangling with the FA they were placed in the Isthmian D1 North. I wasn't initially planning on going to this game as I finished work at 2 and an hour wouldn't be enough to get to Grays, it was more like 1hr 45. But I managed to get out 30 minutes early and so thought I might as well attempt the journey. Traffic around that area was heavy as per usual, but owing to getting a bit of speed up on the previous leg of the journey, I arrived not too far off my intended arrival, getting there at 3.20. Programmes were all sold out due to my late arrival, but I wasn't bothered in those days. I obtained my copy at a later date off of eBay. It was still 0-0 when I arrived but Jon Main scored twice from the penalty spot as AFC Wimbledon continued their fine start to the season with a victory over 10-man Grays. Brett Johnson headed the Dons in front before Main doubled their advantage after Preston Edwards was fouled. Sam Gaughran pulled one back for the hosts, who then levelled when Daniel Charge converted Glenn Poole's cross. But Main scored again after Cameron Mawer was sent off for bringing down Danny Kedwell, who then added a fourth. THE RECREATION GROUND was a smart and tidy non-league ground. Both ends were uncovered terraces, whilst along each side there was covered seating and terracing. Sadly, due to financial issues they vacated the ground and the club took the decision to drop a few divisions, taking a place lower down the non-league pyramid. They have led a nomadic existence since, sharing at East Thurrock and Aveley amongst others.